For most of us our feet do not pose any problem when we participate in physical activity and neither does it occur to many athletes that their feet are at risk when training but in fact they are very vulnerable when engaging in sports and attention should be given to care for them and protect them from damage. Indeed if you are a professional athlete, it should become part of tour everyday routine to maintain and care for your feet as a foot injury may prevent you from playing form a while or even permanently. Why Are Sports People At Risk Of Foot Problems? Sports people may be more at risk of foot problems for many reasons. It might be that they are wearing training shoes for long periods or that they are training hard which can be very hard on the feet. For others it may be that they are so preoccupied in their training schedule that they are not maintaining their feet adequately and allowing hard skin and toenails to deteriorate. What Sorts Of Foot Problems Do Sports People Suffer? There are many conditions that a sports person might find they are more at risk of and these can include athlete's foot, in growing toenails, foot odours, blisters, infections and even a more serious condition called plantar fasciitis. Many of these conditions are caused by prolonged high impact activities such as running or jumping that can cause trauma to the feet or from wearing shoes and socks for long periods allowing the bacteria to soak into the materials and develop into infections. How To Protect The Feet From Sports Damage. Frequent bathing and correct drying of the feet and toes will help to wash any stale bacteria is away which will help to prevent foot odours and infections from developing. Nail care is essential for athletes as an ingrowing toenail can be extremely painful. In some cases it could stop participation in the activity or even warrant surgery which will mean training will have to cease for several weeks. If necessary see a chiropodist regularly who will keep nails in good shape and will be able to identify any problems early on. It is also important to ensure that the correct footwear for the activity is worn, for example a highly supportive trainer that absorbs impact for those who run and jump in their chosen sport. 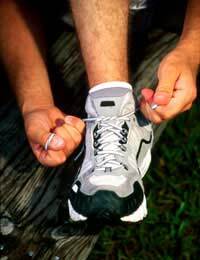 Correctly fitting trainers will also help to prevent blisters, though if they do occur they should not be popped and should be kept clean, dry and covered until they have subsided. If you do go running regularly or are a track athlete, training on an appropriate surface will help to prevent conditions such as plantar fasciitis as a professional track surface will be less harsh on the feet than a concrete road or pavement. The use of heel pads, arch cushions and pads over the typical areas for blisters may be helpful and most sports shops carry a range as do pharmacies and some supermarkets. There are also many specialist retailers available on the internet which sell a wide variety of these types of products though prices can vary considerably. Caring for the feet is important for all of us but may be more of an issue for sports people as their feet will be under more pressure and will often work harder than the average persons leaving them more at risk than others. Adequate provisions should be made when training and competing and awareness of the possible problems will help the individual understand what measures they can take to try and prevent and conditions of the feet from developing.